my dKH was up at 16 for many months and I had no losses until things started dropping then spiking! Consistency is always key in this hobby isn't it? When we start chasing numbers we get I trouble. Sometimes just watching your tank and paying attention to how things look is the best. I think we all fall into the same trap at times and only test when things are bad and have no idea what our parameters are when our tank is happy. I think a lot of people might be surprised at what they find. I was reading an article a while back by Randy Holmes (about high levels of nitrates) where he was talking about the range of parameters our specimens can live in. Even if they are not perfect our specimens can thrive if we maintain good stability of those parameters and consistency in how we maintain our systems. Nitrates are not nearly as bad as nitrites, if your system is breaking down the trites to trates quickly you can get away will somewhat elevated levels like this. And I know your coral looks great so it works for you. Well more progress has been made on the basement. All the drywall is up and will hopefully be finished with mud and tape next week. Slowly but surely coming along. I still need to get the tank ordered though. I'm waiting for a quote from Reef Savvy before I pull the trigger on the one from Planet aquariums. I'm also having a 316 stainless stand made for peace of mind because I know it will last. Damn fish tank is going to cost as much as the basement finish lol! Have you thought about getting a quote from Pidaz? Not really. I guess I could, no offense to them but I want to go with a manufacturer that does really nice work and stands behind their product. This tank will be a permanent fixture in my house so I want to do it right. I also want stainless bracing and a big external coast to coast overflow so it's hard to find manufacturers that can do these things. Last edited by Kirblit; 03-29-2017 at 09:06 PM. No offense taken, but we do offer a pretty killer warranty on our aquariums. We definitely don't want anyone thinking we don't stand behind all of our products. In any case, it looks like your tank space is progressing nicely! Excited to see what you have in store for this. Yea, sorry I didn't mean to imply that you sell a bad product for sure! I just have some special needs in my design and I'm pretty exacting about details. I will definitely be buying a couple tanks from you for the project actually. Probably a cube tank for nems out in front left of the main tank that will be tied in to the system and a shallow frag tank for the fish room. I will be hitting you up at the show for some prices. Update! Basement is coming along well now, things are getting closer. Everything is painted, fish room floor is epoxy now, electrical trim is going up,but most importantly the tank has been ordered! I should have it in roughly a month so I will be needing some help to move the 700ish pound beast! I will post up some cad drawings soon and get some updated pics in here of the basement too! I will get some pictures of the basement when I get home. Here are some drawings of the tank being made by Planet Aquariums. 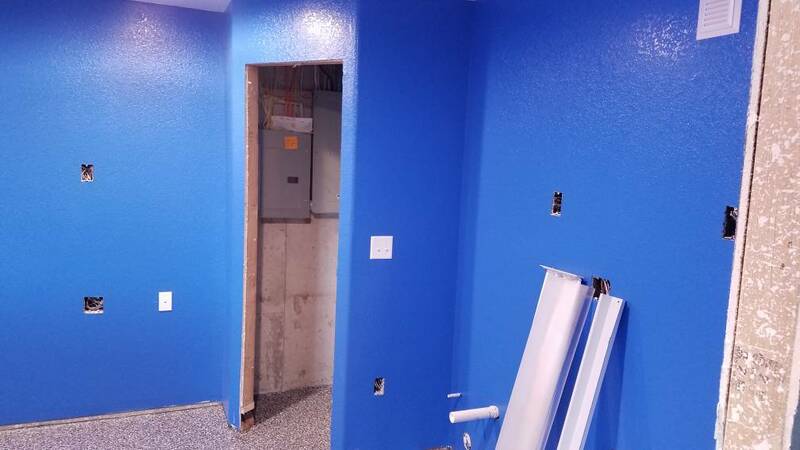 Here are some photos of the basement now and the fish room, aka, the smurf sacrifice room lol. 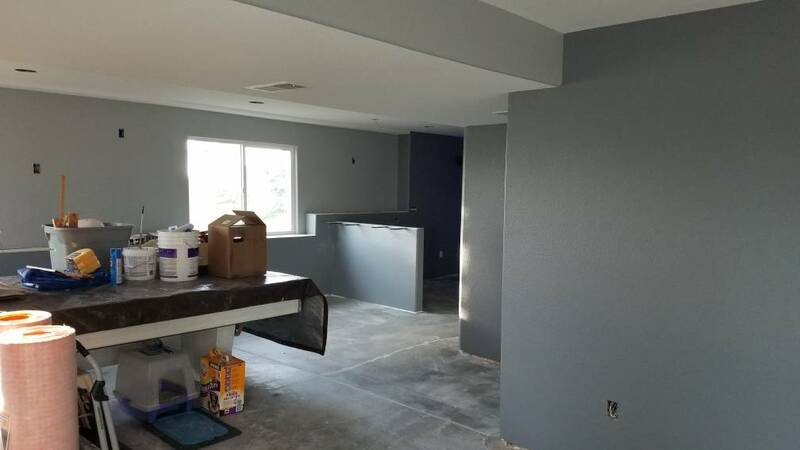 It's getting there I just need to tile the floor and put up trim and doors. Lol, I don't even have a tank yet and then I need to build 2, 100 gal acrylic sumps, 4 different stands, light rack, and cabinet fronts for the tank. The thing that has been holding me up for the last month has been sanding, staining, and finishing 400 ft of Knotty Alder and 4 doors! You may need more electrical outlets. You can never have enough! I put them where I planned everything out for qt tanks, frag tanks, fragging area, pumps, ect. I have 4, 20 amp circuits around the walls and 1, 30 amp circuit in the ceiling. I shouldn't ever have an issue with overloading a circuit! Thanks man. I have to make the man cave sweet and give me a reason to be down there all the time. I will be happy when I can just focus on the tank setup, it really is go to be my dream setup and will be worth all the effort for sure. Man cave? Sounds like a sausage fest j/k bud I'm looking forward to the meeting at Kirby's !!!!!! !